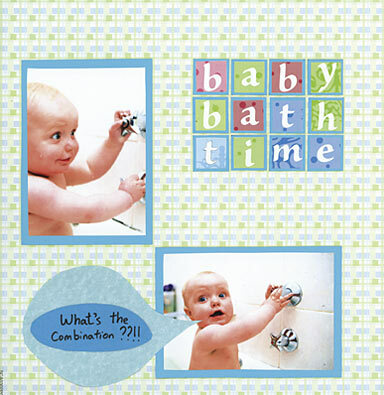 For this bathtime scrapbook layout I found a paper with a bathroom tile feel - not that I know anything about tiling bathrooms. I also went for a 'safe-breaking theme, with a 'model' like this one! Sometimes I find that I only see the potential humour in photo combinations once they're printed off. These two were not taken with the final journaling in mind, but once I saw the two together, the layout virtually made itself. You can always be creative with the chronology of your photos. Your descendants won't care! Had I got hold of Jen Gormley's excellent '500 Scrapbooking Sketches' BEFORE I made this layout, I might have achieved a more satisfying look. I'll have it for next time instead. If you look about half way down this page you'll see how she's used a basic line drawing as a template from which she's created a very attractive layout indeed. ALL the supplies used in this bathtime layout arrived as part of a gift from the UK title 'Scrapbook Magazine', when they were kind enough to feature me as a quirky male scrapbook person. The only thing is, I've not got the slightest idea whose papers I'm using! I did feel they gave me the bathroom feel I was after, though, especially when I could make the 'tiled' journaling fit into the grid pattern of my 12 x 12.